Biomarker research is transforming how the pharma industry approaches a number of challenging therapeutic areas. In oncology, for example, predictive biomarkers have played a pivotal role in evolving what was once primarily a chemotherapy, one-size-fits-all approach to treatment into a personalized approach based on a person’s individual tumor biology. Translational medicine plays a critical role in advancing this emerging field of research. By providing R&D departments with the capabilities to generate better hypotheses, implement new insights in clinical trials, and accelerate their pipelines, biomarkers have been able to quickly impact the treatment landscape for patients. At Bristol-Myers Squibb (BMS), researchers are using predictive biomarkers to help identify and develop targeted treatment approaches for patients who are resistant to current I-O therapies. In rheumatoid arthritis, BMS is studying biomarkers that may offer the possibility of diagnosis before joint damage becomes clinically apparent – a potential game-changer for patients with autoimmune disease who can wait years for diagnosis. 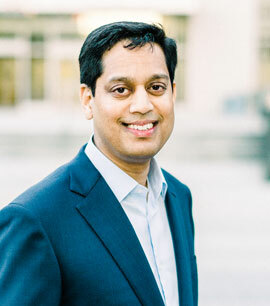 Pharm Exec recently spoke with Saurabh Saha, M.D., Ph.D, Senior Vice President and Global Head of Translational Medicine at BMS, to share his perspectives on the current biomarker landscape, the role of translational medicine in accelerating this area of study and how BMS is working to advance biomarker research across their R&D portfolio. Pharm Exec: Can you outline the current opportunities and advancements in the biomarker market? Saurabh Saha (Photo/Jen Randall Photography)Saurabh Saha: Within the immuno-oncology (I-O) arena, we’re actively evaluating multiple biomarkers to better understand their potential in predicting how a patient may respond to I-O treatment. We are also investigating biomarkers across other therapeutic areas, including a pro-peptide known as PRO-C3 as a potential biomarker for nonalcoholic steatohepatitis (NASH), which currently can only be diagnosed through an invasive liver biopsy, and anti-citrullinated protein antibodies (ACPA) that may help physicians diagnose rheumatoid arthritis before joint damage becomes clinically apparent. What key challenges remain in translational medicine? Translational medicine includes all of the activities that are necessary to profile a patient’s disease biology so we can provide the patient with as many treatment options as possible, and to increase both the speed and success of our drugs through the clinic. Every patient has a unique disease biology, which means there are no one-size-fits-all approaches to treating many conditions. Even with biomarkers in I-O, there is no single marker that will tell us everything; it will vary depending on the type of cancer and the status of that tumor. Another challenge is that in order to help streamline clinical trials and develop safe and effective therapies at a faster rate, we need to continue finding new ways to generate more actionable, testable hypotheses, while focusing our efforts on the ones most likely to succeed. What distinguishes BMS’s activities in this area from what you’ve seen in your previous roles? I believe what makes Bristol-Myers Squibb unique is that we invest an enormous amount of time and resources across all areas of translational medicine and push the boundaries of science.Additionally, our translational medicine team is truly a core group. Every area, from translational pathology to bioinformatics, is fully integrated across our discovery and clinical development teams, which allows for rapid, efficient knowledge-sharing and collective idea generation. As global head of translational medicine, can you outline how your activities will have global reach? I am responsible for overseeing our robust translational medicine program and driving early clinical development across the pipeline, with the goal of driving new compounds to clinical trials, and hopefully one day, regulatory approval. Given Bristol-Myers Squibb’s global presence, I have an excellent opportunity to drive our research and development efforts worldwide. Collaboration is of course key to translational medicine. How do you see BMS and pharma in general furthering its collaborative initiatives in this field? Solving the puzzles for challenging diseases will require a collaborative effort across multiple sectors. At Bristol-Myers Squibb, we have more than 75 active partnerships and collaborations with academic research centers, laboratories, clinical trials organizations and biotech firms, which complement our unique translational medicine offering. One great example of this is the International Immuno-Oncology Network (II-ON) – one of the first peer-to-peer collaborations to bring industry and academia together – which aims to advance I-O science and translational medicine through innovation. Since Bristol-Myers Squibb formed the network in 2012, the II-ON has produced data from a plethora of research projects and launched 14 biology-driven clinical trials across 22 different tumor types. Insights from these data have led to several published papers and even some of the earliest findings on a number of biomarkers. Another example is our participation in the Accelerating Medicines Partnership (AMP). This consortium of industry, academics and the National Institutes of Health came together to develop new ways of identifying and validating promising biological targets for diagnostics and drug development. Through the AMP RA/SLE program, we are working with the partners to address relevant challenges for rheumatoid arthritis (RA) and systemic lupus erythematosus (SLE), two key areas of focus for Bristol-Myers Squibb. The data generated from this research will be publicly available, and could potentially be applied to diseases beyond RA and lupus. In the future, I imagine the focus on collaborations will continue to become more important as we work to generate insights as a collective research community. By working together, both pharma and its partners can play an essential role in advancing novel, translational science.